Manzetti, S., Lu, T., Behzadi, H., Esrafili, M. D., Le, H. L. T., & Vach, H. (2015). Intriguing properties of unusual silicon nanocrystals. Royal Society of Chemistry Advances, 5(95), 78192-78208. Manzetti S, van der Spoel D. (2015). Impact of sludge deposition on biodiversity. Ecotoxicology, in press. Manzetti S, Kobe B. (2015). 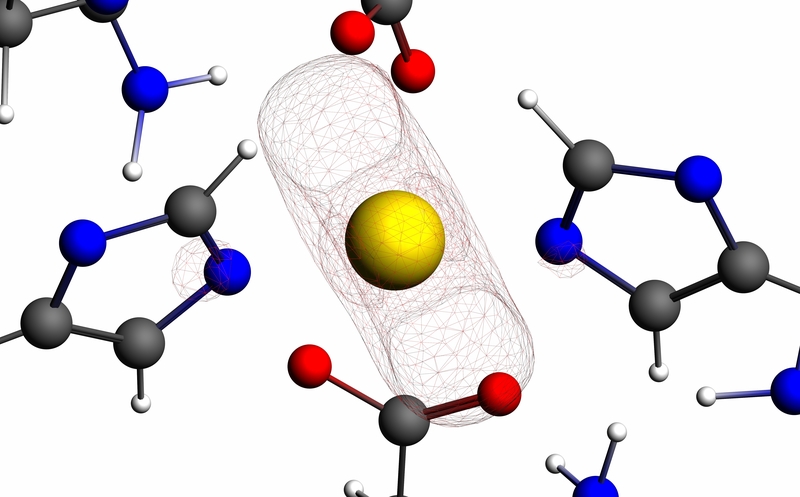 Quantum chemical calculations of the active site of PsaA enzyme from Staphylococcus Pneumoniae reveal a crucial relationship between ionic electron configuration and enzyme activity. Annual meeting of the Swedish Chemical Society Theoretical Chemistry Section 2015. Book of Abstracts. August 25-27 2015 Kalmar, Sweden. STC2015. Download here. Manzetti S., Vasilache D, Enrichi F. (2015). Emerging carbon-based nanosensor devices: structures, functions and applications. Advances in Manufacturing, 3:63-72. Manzetti S, Andersen O. (2015). A review of emission products from bioethanol and its blends with gasoline. Background for new guidelines for emission control. Fuel, 140, 293–301. Figure. The active site of the PsA-metalloprotein of S. Pneumoniae, calculated using the M06-2X level of theory of quantum chemistry. Click to enlarge.